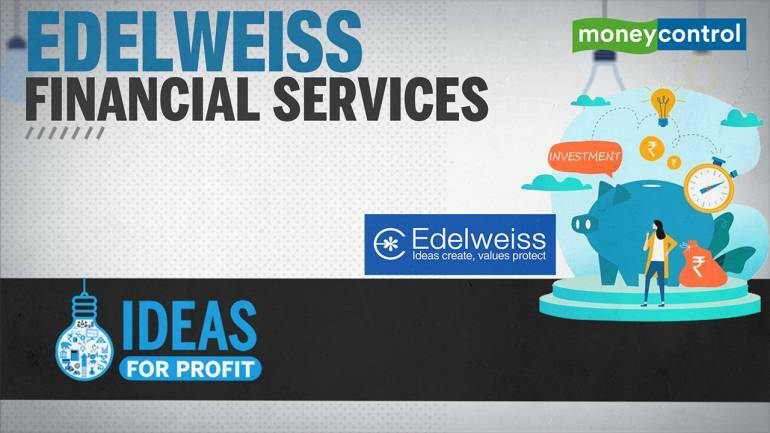 Edelweiss Financial Services has been one of the fastest growing non-banking financial companies (NBFCs) in the country. But just like for most NBFCs, the company’s fast-paced growth was interrupted by the liquidity crisis that engulfed the NBFC sector in September 2018. Its lending business is facing sectoral concerns in the form of constrained liquidity. However, it will be able to tide through the crisis period as its presence across diversified business segments will come to its rescue yet again. At least, Edelweiss’ history of more than 20 years suggests so. In each of its ‘difficult’ phases in the past, Edelweiss had identified areas of growth. In the slowdown of 2001-03, it moved from an investment banking firm to a broad-based capital market focusing on retail stock broking and the initial public offering (IPO) business. By 2006, it was a full-fledged capital markets firm, but forayed into the lending business through ECL Finance at a time when banks were a dominant force in this space. While the first investor in its lending business -- Lehman Brothers -- didn’t survive, ECL Finance has grown by leaps and bounds. Edelweiss floated an asset reconstruction company (ARC) at a time when no banks were selling bad assets to ARCs, which today has emerged as the largest ARC in India. The key factor common in its diversification pursuit was tight risk management and control, which helped it survive and flourish in the aftermath of numerous crises it witnessed in the past 22 years. Thanks to such resilient performance, Edelweiss’ stock has risen around seven times in the past five years (generating 45 percent compounded annual return) even after considering the recent fall of around 40 percent from its 52-week high. Going forward, we see the management building a significant market presence in some of its chosen lines of businesses, resulting in higher earnings and accruals to capital. Accordingly, investors can expect significant value creation, albeit in the long run. The company’s credit business is a key revenue and profit driver and contributed 84 percent to consolidated profits (pre-minority interest and excluding insurance) of the group in the first nine months of FY19. The group’s credit book stood at Rs. 42,380 crore, consisting of corporate (42 percent of the loan book) and retail segments (42 percent) and distressed credit (16 percent) as at December 31, 2018. Its retail loan book grew 25 percent year-on-year as at December-end, which is very encouraging. Increasing prominence of the retail financing business is evidenced by the increase in share of the retail book to 42 percent of its overall portfolio as at December-end from 28 percent as on March 31, 2015. The management intends to increase the retail share further in coming years. Following the liquidity crisis, Edelweiss reduced disbursements in the wholesale segment and has adopted a cautious approach to the retail segment. Accordingly, growth in the lending business will be curtailed in the medium term given its propensity to conserve liquidity. Asset quality has been resilient so far. That said, asset quality of its wholesale lending book, in particular, is highly vulnerable and any sharp deterioration in it can adversely impact profitability and capital. 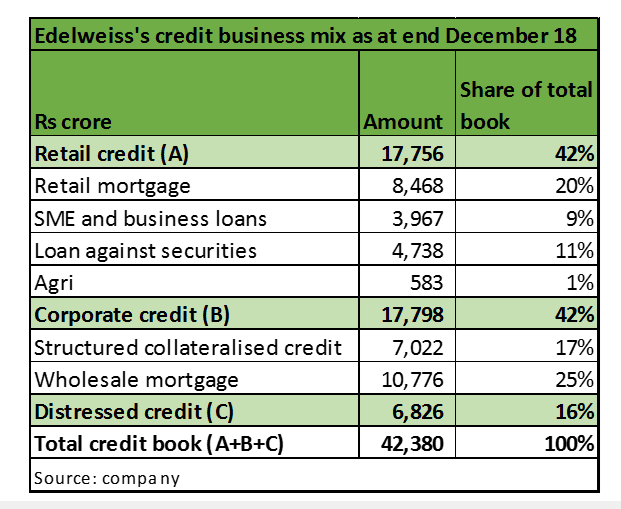 Edelweiss has employed a capital of Rs 6,826 crore in distressed credit business and operates the largest ARC in India, with a book size of Rs 45,100 crore. Prospects of its ARC business looks promising as it can potentially generate high carry income (more than 16-17 percent internal rate of return) in case the asset realisation is higher than the price at which was acquired. However, its performance in the distressed asset segment hinges on availability of capital, which is not a bigger concern, given that CDPQ holds 20 percent stake in the ARC business. Performance of the wealth business continues to be impressive. Assets under advice (AuA) stood at Rs 1,00,300 crore, registering a growth of 18 percent YoY. About 27 percent of these assets are under advisory model, while the bulk of them are distribution assets. Total assets under mutual funds and alternative stood at Rs 25,300 crore and Rs 11,100 crore, respectively, as at December-end. Both these segments together constitutes the asset management business of Edelweiss and has seen a robust growth of 40 percent YoY as at December-end. Though it failed at getting a banking licence, we are enthused by the fact that over a period of time Edelweiss has evolved into a ‘bank-like’ structure with diversified revenue streams. Profitability has improved over the past few years. However, it still remains sub-optimal with return on assets (RoA) of 1.8 percent and return on equity (RoE) of 13.9 percent for the 9M FY19, respectively. The costs associated with incubating new businesses is dragging down the group’s overall profitability. A significant portion of the group's capital (around 25 percent) is employed in businesses that are either low-yielding or loss-making at present. For instance, the life insurance business continues to be loss-making and the general insurance business, which commenced business last year, is also expected to reduce consolidated profitability in the initial years of operations, given its long gestation period. Added to this, Edelweiss runs a balance sheet management unit (BMU) -- group’s active treasury function that supports its liquidity position. The capital employed in BMU earns a low return. 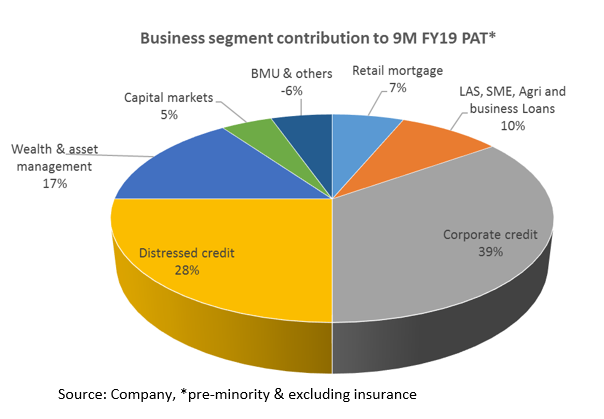 In the medium term, despite the expected moderation in its lending business, we see NBFC’s profitability to be supported by steady growth in wealth and asset management businesses as well as healthy recoveries in its distressed credit business. It is worth noting that both these businesses have the potential to provide a huge RoE fillip. 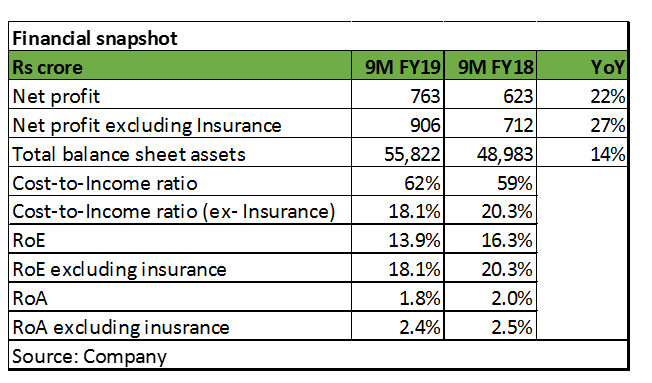 Over the long term, likely improvement in the profitability of its insurance business and reduction in the share of funds allocated to BMU will add to the group's profitability. While the stock has seen some smart recovery of late as access to funding improved, it is still down more than 40 percent from its 52-week high. The sharp fall in stock price has eliminated valuation froth creating a favourable risk–reward for the stock, making its worthy bet for the long term. On the valuation front, the stock is attractively priced, with the lending book at 1.9 times FY21 estimated book value and franchise business at 19 times FY21 estimated earnings price-to-earnings. Given the multiple growth levers, investors with a long-term horizon wanting to participate in a diversified financial services company should but into the stock.